As long as humans have existed, we’ve attempted to explain where we came from, who we are, and where we are going. It’s human nature to look up at the stars and see the lives of gods unfold before us, or gaze into the depths of the ocean and imagine hidden worlds and deep mysteries that can unlock the secrets of our past. Creation myths exist in virtually all human cultures. We wouldn’t be human without them. These myths of creation are not too far removed from reality; indeed, it is likely that life on Earth originated in a broth of potential, a kind of primordial soup. It was in those ancient oceans that life began and then slowly evolved. It was out of ancient tidepools that our distant ancestors crawled onto land. The salt water that flows in our veins is a reminder of our origins; our very beings are those same liquids recycled billions of times into new forms. Just as we are made of stars, we are also filled with oceans. Visiting the ocean is a primordial calling, a return home. The depths of the ocean hold great terror and ultimate safety: to us, it is everything that will be and ever was. Our origins come from glistening eggs and crashing waves. Even our eyes are not eyes designed for seeing through air but rather eyes designed for seeing through water, adjusted to our new home over time. The water in that dark, brooding ocean has been around for billions of years. Each drop in that vast gray sea has gone through countless adventures, has passed through many beings, and has been recycled over and over. Every time you drink a glass of water, you’re drinking what was once dinosaur pee. Every time you take a bath, you’re probably bathing in at least a few molecules shared with some of the most influential humans in history. You’re brushing your teeth with Cleopatra’s rose bath water or washing your face with the blood of soldiers slain thousands of years ago. It’s incredible to think that all of the complexities of life, all the millions of years of human history and culture, and all of the rich details that fill our world today came from that same ancient liquid, that cosmic milk or primordial soup of potential. The origin of life remains a mystery; no-one knows how or why it began those aeons ago. Perhaps we will never know. We just have to be grateful that it was our earth that became home to such a plethora of life. Great concepts to reflect on over a cup of tea and a cake, no? These lovely little cakes are an ode to the dark mysteries of the Pacific. They’re gluten free cakes (though you could certainly bake them with normal flour) made with black cocoa to get an inky black color. The secret ingredient is dulse seaweed. You can’t taste it in the batter, but it gives a faint saltiness and flavor of umami that makes this cake recipe extra rich and toothsome. Even better, it helps the cake retain moisture so this delicious treat will stay soft and tender for days - very unusual for gluten free treats. 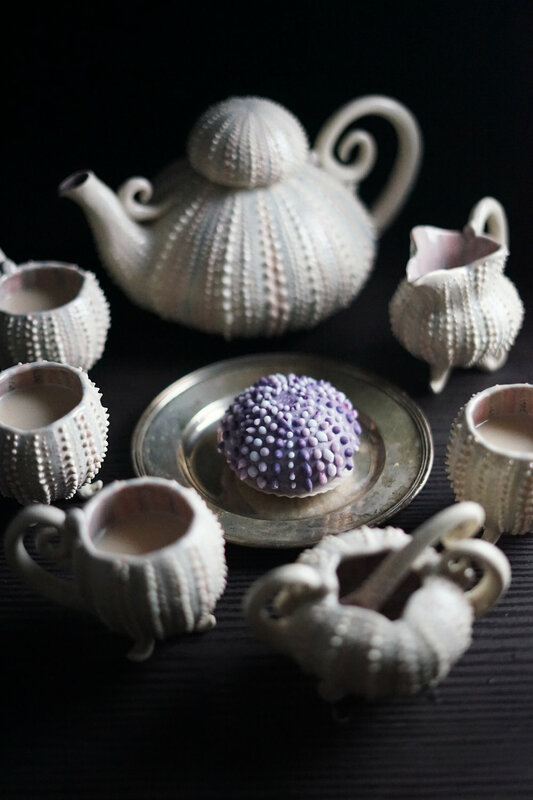 A dash of dark rum rounds out the palate and a coating of berry fondant dresses each cake up as sea urchins, a tide-pool presence that reminds me of our scale of life. 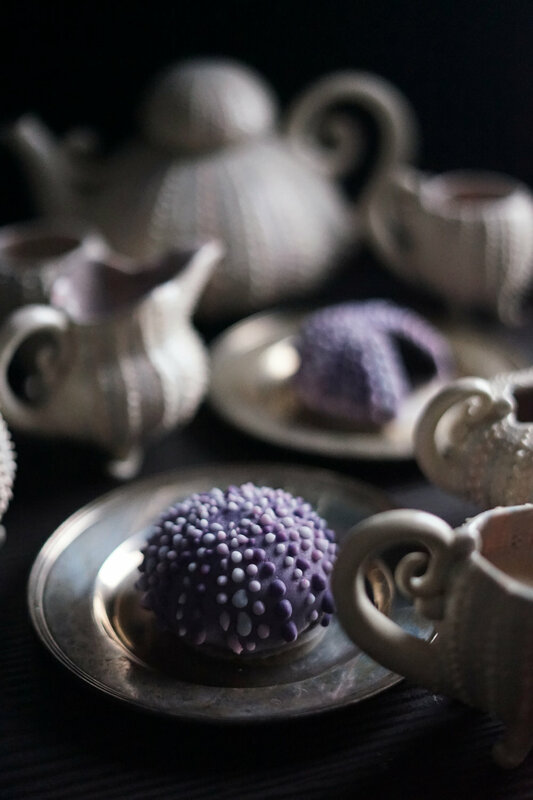 Served with these tea cakes is cosmic milk tea, a rich and sweet liquid brewed with a blend of smoky lapsang souchong tea and dulse seaweed, then sweetened with honey and cream. This blend smells like campfires on the coast with all the comfort of warm milk on a cold day. It has a complex flavor and slight saltiness, reminiscent of the sea spray that inspired it. It’s also very fortifying; seaweed is packed with essential vitamins and minerals (omega-3s, amino acids, iodine, potassium, magnesium, antioxidants, and more). It’s the perfect drink to wash down some urchin cakes and big concepts. This recipe makes 18 small cakes if using the mold linked to below. Allow the seaweed to soak in the spiced rum for at least 15 minutes, while you prepare the rest of your ingredients. Preheat oven to 350F and place a rack in the center of the oven. Sift the dry ingredients into a mixing bowl and whisk to blend. Make a little indentation in the dry mix. Whisk the eggs until smooth, then add the vegetable oil, vanilla extract, coffee, and dulse-whiskey. Whisk well. Pour the batter into the half-sphere pans, filling them about ¾ full. Bake the cakes until they feel firm when gently pressed and a toothpick inserted comes out clean, about 25 to 35 minutes. Let cool completely to room temperature, then remove from molds. This is easiest to do by using a large spoon to gently go around the edge of each cake. Place the cakes in the freezer and leave for at least an hour, or up to overnight. Using a serrated bread knife, carefully carve the sharp edge of the flat side of the cakes into a more urchin-like shape. Store in the freezer until the fondant is finished and you’re ready to decorate. Sift the berry powder with the powdered sugar into a small bowl. Place your shortening into a large bowl and add the marshmallows. Melt the marshmallows for 30 seconds in the microwave or on a stovetop and stir. Repeat twice more, or until the marshmallows are all melted. Add the vanilla, water, and corn syrup to the marshmallow mixture. Mix until smooth. Add half of the berry-powdered sugar mixture and mix for 2 minutes or until smooth. Scoop the marshmallow mixture out of the bowl and place it in the bowl with the rest of the powdered sugar/berry mixture. Knead until the powdered sugar is incorporated into the marshmallows and forms a smooth and stiff dough. If you live in a dry climate, you may not need to use all of the powdered sugar mixture. Before using to cover the cakes, work the fondant a bit with your hands to soften it. Knead if needed. Then roll out on a silicone baking mat or counter dusted with powdered sugar. Gently roll your fondant out on a piece of parchment paper until it is smooth and thin. Cut a 6” wide circle for each urchin cake. Keep the rolled fondant covered in parchment paper or plastic wrap while you work with one piece at a time. Place a fondant circle on top of the jelly-brushed cake. Gently press the fondant down onto the cake, avoiding any folds. Wrap it around the bottom (there will be some folds here.) Trim so that it overlaps the bottom by about ½” all the way around. Cut a smaller circle of fondant and place it on the bottom. You may need to lightly brush the fondant with a bit of water to encourage adhesion. Once everything is smoothed out, use a small round object ( like a pen lid) to create a small (like ¼”) circle on top of the cake. Use a toothpick to poke lines out from this center point into the fondant (being careful not to poke all the way through. 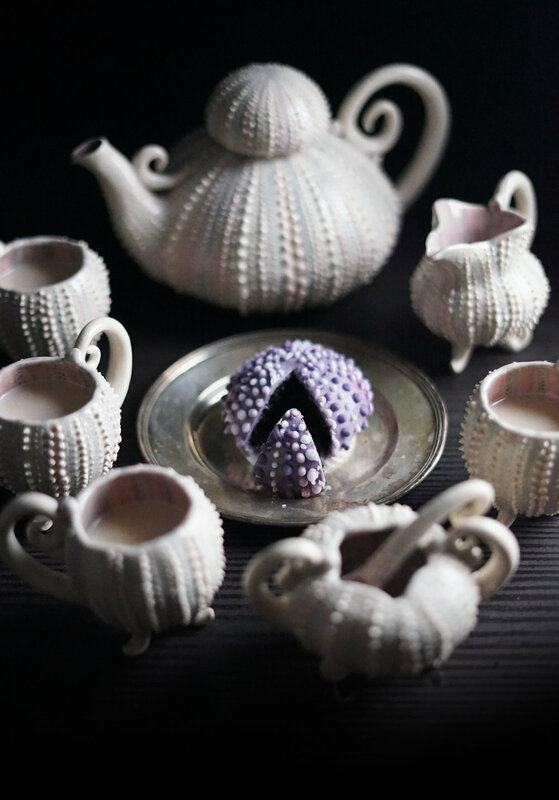 Sea urchins have 5-point symmetry so you should have 5 evenly-spaced lines. Repeat the process with the remaining cakes. Once all of the cakes have been covered in fondant and decorated as described, make your royal icing. Put the rum and the water in a small bowl. Slowly add powdered sugar, 1 Tbs. at a time, until you’ve reached a pipe-able consistency. You can divide it up and tint it various shades of lavender and purple using the same berry and flower powders as above. Transfer the icing into a piping bag fitted with a small round tip. Carefully pipe little dots on the urchin cakes as shown to make them as realistic as possible. You can also add more poked lines as well at this point. This is meticulous work, but I really enjoy it. Take your time and maybe put on some good music or a show while you work. 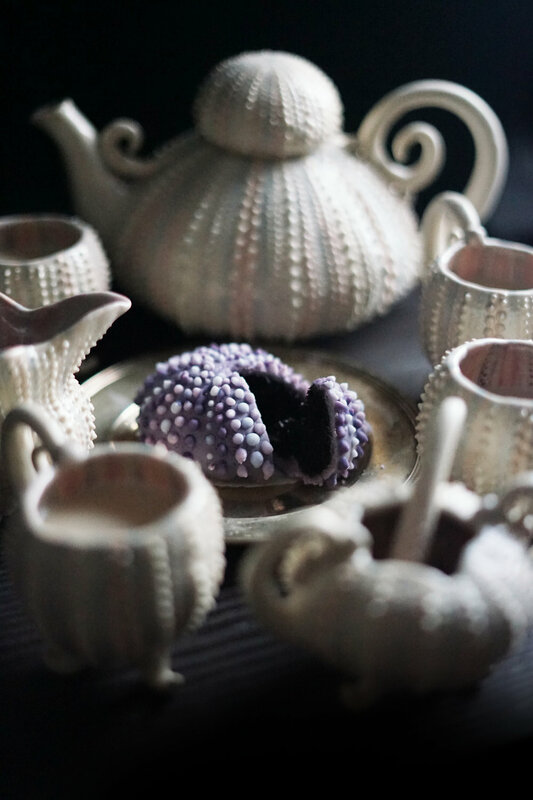 Once you’ve piped all of the urchin cakes, let them sit at room temperature until the royal icing has hardened. Serve with Cosmic Milk Tea, below. This recipe brews a small pot of tea, suitable for 2-4 people. 1. Steep the tea and dulse in boiling water for 5 minutes, then strain. Stir in the honey and cream and serve hot. *New to foraging and don’t know where to start? Check out this blog post on Foraging 101!